From acrobats and jugglers to string musicians and poetry readings, World Wide Artist Experiences provides free arts performances throughout the year at Maryland Hall for the Performing Arts to promote international goodwill and understanding. This year they are presenting an International film festival and tonight the film is from Poland. Ile waży koń trojański? means “How Much Does the Trojan Horse Weigh? It’s uses the vehicle of time travel aka “Peggy Sue Gets Married” to explore the result of the political and social changes in late 20th century Poland. At 40, Zosia (Ilona Ostrowska) is happliy married and living in Warsaw. She has a daughter and a successful career. But as she and her family usher in the year 2000, she wishes some things in her youth had happened differently, and she’s magically transported back to 1987, when she was still married to her womanizing first husband. Director Juliusz Machulski is known for his successful commedies, but this is a serious film. Machulski uses the film’s plot to chart Poland’s transition from communism to capitalism, a subject even more engaging than the foibles of his plucky heroine. In Polish with subtitles, the showing begins at 7:00 p.m. and is free. Sounds like an interesting evening. Tucked away in the far corner of the St. John’s College campus in Annapolis, sits The Mitchell Gallery. This handsome modern building, built in 1989 provides exhibition space for visiting shows from art museums from around the United States as well exhibitions vetted by local curators and art historians that highlight artists and craftsmen residing locally. Although visited by thousands of art lovers each year, the gallery is still a hidden treasure. Many local residents have no idea of its existence despite its 20 plus year presence. This June, to honor its 20th Anniversary an event is being planned enittled “The Art of the Book” that will highlight art and literature. Save the date, June 25th, when authors and artists will be on hand to celebrate the Mitchell Gallery and provide an exhibition of art work inspired by books along with workshops and panel discussions and a silent auction to raise monies for the Mitchell Gallery. 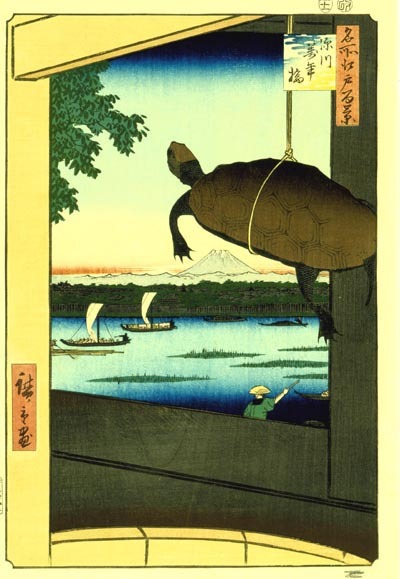 Next week the March exhibit “The Floating World: Ukiyo-e Prints from the Lauren Rogers Museum of Art” will be opening on March 3rd and will hang until mid April. This exhibition of 50 Edo period (1603-1868) prints reveals an intimate history of Japanese print collecting in the South in the early 20th century. Internationally know ukiyo-e print expert Frederick Gookin, Lauren Rogers Museum of Art founder Wallace B. Rogers created a superb collection in the 1920’s. The prints encompass all of the ukiyo-e subjects: beautiful women, actors and the theater, landscapes, narrative scenes, and decorative themes. The Gallery is open from noon to five, Tuesday through Sunday and Friday evenings from seven to eight. Admission is free. For more information call 410-626-2556. If you are inspired to donate a collectible book to the Art of the Book silent auction in June, please contact me via this blog. Thank you! I’e discovered a new venue for dancing. Last week I wrote about the Red Dress Dance at the Spanish Ballroom at Glen Echo Park. What a beautiful space with tall ceilings, a large stage for a big orchestra, and beautiful wood floors for doing everyting from the Lindy hop to a waltz. The only drawback was it was very cold. The temperature was only in the 50s and some of the ladies were wearing gowns held up with spaghetti straps. Oh those cold shoulders. I never took off my sweater. It is just too expensive to heat such a large open building. To stay warm, my husband Peter and I just kept dancing for three hours straight. We were even dancing to the taped music when the band went on break. Towards the end of the month I hope to be back there again. Here’s some of what they have scheduled. The next evening return to dance again to the wonderful sound of the Tom Cunningham Orchestra from 8:00 p.m. to midnight, In the Spanish Ballroom, admission is $15. And on Sunday afternoon there is a tea dance! Join the Hot Society Orchestra of Washington for an afternoon of dancing, featuring music and dances from the 20s, 30s and 40s. 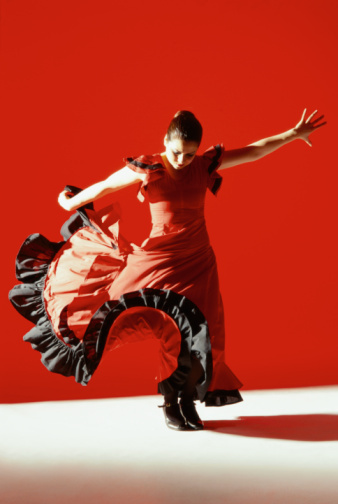 Dancers will enjoy foxtrot, two-step, waltz, cha-cha, rhumba, swing and more in the Spanish Ballroom. A basic dance lesson at 3 pm for all levels is followed by dancing to wonderful live music from 3:30 – 6:00 pm. This month’s dance lesson is the basic Rhumba provided by professional dance instructors from Dushor Dance Studios. Admission includes the lesson. No partner or prior experience needed. Spanish Ballroom. Admission is $15. If you need some brushing up on your dance technique they will start off the evening with a beginning swing lesson from 8:00 pm – 9:00 pm, and then the Eric Felten Jazz Orchestra (complete with a romantic male crooner) will take the stage for your dancing pleasure until midnight. Ideally all ladies should wear a red dress. If you don’t own a red dress for dancing, perhaps some red shoes or a red rose behind the ear will do! While the picture I selected shows a Flamingo Dancer, inspired by the location of the Spanish Ballroom, more appropriate would be attire reminiscent of the 1940s,50s, and 60s. A full skirt that swings is always fun to wear when you are dancing the jitterbug. At any rate, the Red Dance Ball sounds like fun, so that is where I’m planning to be on Saturday night with my valentine. Happy V-day. Tonight I’m going to the premiere performance of Inventing Van Gogh and I’m excited about seeing it this play, because I really enjoyed Shooting Star by the same playwright Steven Dietz currently being performed at Everyman Theatre in Baltimore. You can read my review on the What’s Up Website. Inventing Van Gogh. playing at Colonial Players, deals with the question of what is unique in the world of Art and does the “Master” overshadow his creation. I’ll be posting my review of the performance on Monday. But if you don’t want to wait until the reviews are published, the second ticket is half price when you go with a friend this weekend as well as on the evening of February 13th. Call their box office at 410-268-7373. Saturday night there is a Mardi Gras benefit for Opportunity Builders a wonderful organization that provides work opportunities for adults with developmental disabilities by providing vocational training, employment services, recreational activities and support services. Tickets are $50, include a buffet dinner and silent auciton. If you are looking ahead as far as making plans, The Mardi Gras Gala to benefit the Arts Council is coming up on February 19th and it is a glamourous and festive evening at the Loew’s Hotel downtown. Just think, if you don’t get around to celebrating Valentine’s Day on Monday the 14th, you can wait until Saturday the 19th. Tickets are $150 each and include dinner, drinks. dancing, and a silent auction ALL to Benefit Arts and Historical Preservation groups in Anne Arundel County. Visit their website You can dress in formal attire, a costume, and/or wear a mask! It may be cold out, but we’ve got a lot of fun things to do. 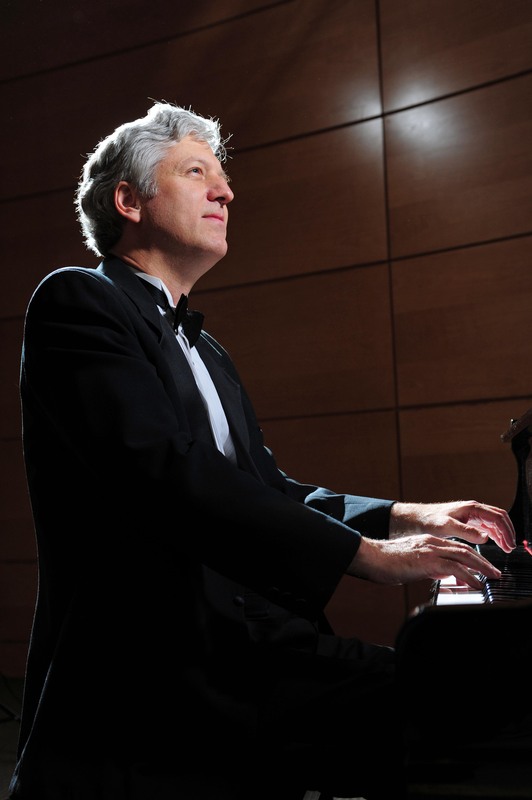 The first time I ever heard Brian Ganz play the piano was at the Unitarian Universalist Church of Annapolis, where I am a member, and I knew I was hearing something special. Many talented musicians are members of the congregation and give freely of their time to perform as part of morning services and to also accompany hymns, but when Brian’s fingers touched the piano keys, the percussive stringed instrument began to sing. The phrasing of the notes, the pressure on the keys, and soulfulness of whatever piece he was playing told me a story. I was in love. I immediately wanted to know who was this pianist and when was he going to play again. Over the years, Brian has treated the UUCA to concerts raising money for a variety of causes and he has been accompanist for The All Children’s Chorus, and the last half of 2010 he filled in as accompanist for the UUCA choir (too bad I’ve had to drop out of the choir due to lack of time to attend rehearsals). He does this all in addition to his teaching posts at St. Mary’s College, Peabody Conservatory, and his regional concert performances. Now Brian has embarked on a new endeavor–performing ALL the piano works of Frederic Chopin (1810-1849) within a ten year period. He got off to a good start this past Saturday evening at The Strathmore in North Bethesda. Pairing early works (some written by Chopin at the tender age of seven) with mature works in the same musical form. While he began with Waltz in E Major, written when Chopin was 19, and paired it with Waltz in E-flat Major, Opus 18, written just two years later; later in the performance he moved on to the Polonaises in G minor and B-flat Major written when he was seven and paired it was Polonaise in A-flat Major, Opus 53, written when he was 33. Brian took a great deal of time, in between pieces, to share his knowledge with the audience. While some may have found this annoying, I enjoyed learning more about what I was going to hear. His next performance at The Strathmore, with the National Philharmonic, will be the Grieg Piano Concerto on March 12th. Take note that all children attend National Philharmonic concerts for free. As for another Chopin concert, you’ll have to wait until February 2012. Remember that everything is committed to memory, and it has to be exquisite. Read more about the Chopin project on our WhatsUpMag.com website. The Eleventh Annual Annie Awards took place last night at the Severn School in Severna Park. 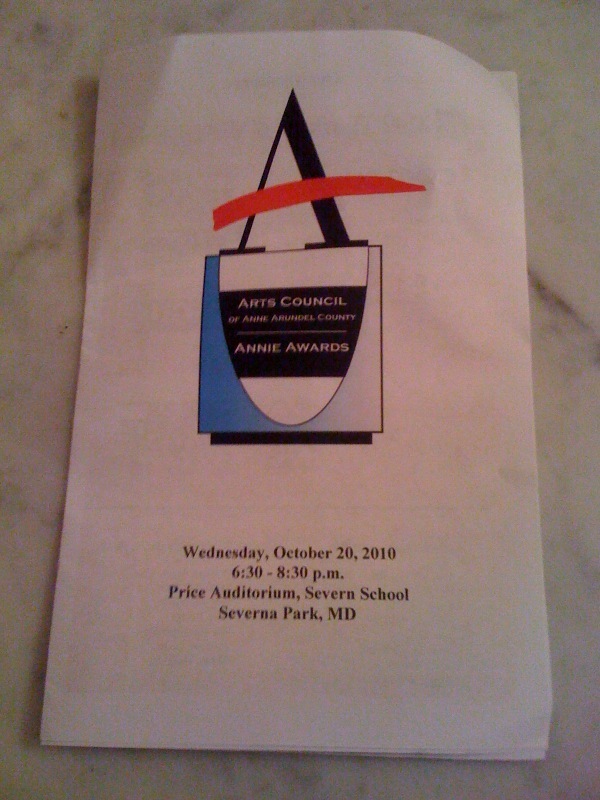 Created and produced by the Anne Arundel County Arts Council, the awards endeavor to highlight and support the achievements of local arts patrons, educators, performers, writers, and artists. One category sadly missing, is one to credit the work of historians and preservationists in our county rich with colonial era history. That omission was remedied last night when Donna Ware, current Executive Director of Historic Londontown and Gardens was given the lifetime achievement award. I have Donna’s book,Anne Arundel’s Legacy, The Historic Properties of Anne Arundel County on my bookshelf and I still consult it often, even if I don’t have as much time as I once did to write on historical subjects. Donna has many accomplishments, too numerous to list in this blog, but looks to young to be honored for “lifetime achievement” since she is still vitally active in her field and has many working years ahead of her. But, she greatfully accepted her award and the honor, as did all of this year’s winners, who each had meaningful and entertaining remarks to share with the audience. Having been a past and founding member of the Annies Committee for nine years, and a recipient (in the literary category) last year, it was a treat to sit back this year in the auditorium and be an observer. I was impressed by the number of sponsors, including the providers of food and drink, and the large attendence. Particularly moving, and remarked upon by many afterwards, was the poem read by this year’s Literary Annie recipient, poet Temple Cone, an Annapolis resident who teaches literature at the U.S. Naval Academy. I longed for more sharing of the various winners’ talents as part of the entertainment and slideshow. But maybe next year. Well done work, Arts Council and Annie Committee. When we get all the photos, we’ll post them online at wwwWhatsUpMag.com. But until then, mark your calendars for their Bag Lady luncheon and Sale next month, Sunday November 7th at the Loews Hotel. You’ll probably see some Annie winners there!